I was one of many who turned out for Dan Meyer's session, which focused on why teachers should be using technology to capture, share, and resolve perplexity. What's perplexity? Dan described it as "not confusion" but a "wanting to know, thinking you're able to know." Dan is careful to differentiate perplexity from engagement, as we've all been engaged in something that was simply tedious or boring. This kind of perplexity describes a particular state of mind, one with more promise than the traditional definitions that describe perplexity as full of uncertainty and difficulty. However, when Dan speaks of "capturing" and "sharing" complexity, he's not so much describing a state of mind as he's describing the kinds of phenomena that provoke the asking of mathematical questions accompanied by an eagerness to mathematize. I'm hoping as Dan and others go forward we develop some sort of theoretical basis for these phenomena, or at very least, a useful classification system that can aid in task design. For example, I see the phenomena of scale frequently in Dan's work, provoking questions like "How much might the big blue bear weigh if it were a real, live bear?" For capturing perplexity, Dan showed various tools for finding and saving things from the web and the world. These tools included an RSS reader for following blogs and news sites, a tool for downloading and saving YouTube videos, a note-taking application, a tool for capturing audio memos, and the camera on your phone. The particular tools here don't matter as much as knowing why to use them — they key is finding the tools that work well for you. For sharing perplexity, Dan included technology like a computer with speakers and a projector, a document camera for showing student work, slideshow software, editors for photos and video, and a personal blog to "share the best stuff you do publicly." For resolving perplexity, Dan made some connections to the Common Core State Standards. Standards aren't technology like computers and smartphones, but the CCSSM — particularly the Standards of Mathematical Practice — can be seen as tools for mathematical task design. There's a lot in the world that could be mathematized, but having a set of standards can help make sure it's done with the right content and practices in mind. You can access Dan's shared resources for the session at nctm13.mrmeyer.com. I think Christopher Danielson said most of what I was thinking during this somewhat odd father-daughter session. It's difficult to describe the vibe that was in the room, with the presenters casually and sometimes clumsily taking turns describing then showing their videos. Near the end Vi grabbed a guitar for a rather brave musical performance that filled me with some kind of vicarious embarrassment, as if Fiona Apple had gone on stage thinking she was singing for lovelorn teens when in fact it was just those teens' math teachers. Then again, I feel embarrassed for others quite easily. Perhaps I shouldn't be too critical. Some of the videos were pretty cool and who among us hasn't had at least one "Hey guys, check out this thing on YouTube" kind of moment? Having a big conference in your backyard is very nice, although I spent far more time on the bus or waiting at bus stations than I would have ever imagined. I take conferences seriously and believe in attending as many sessions as possible. Just as I never skipped a class in college -- and felt guilty about missing anything even when it was absolutely necessary — I'm not one to turn a conference visit into my personal vacation. So my NCTM experience turned into an 80+ hour grind investment not only in my own education, but as a proxy for the many who couldn't attend. I tried to seek out a balance of sessions that were personally beneficial, high quality, and of wide interest. In a conference of this size there is plenty to choose from, but the downside of that is that session proposals are almost comically short and descriptions in the conference program don't provide much detail. The sessions are also of varying length and they overlap, which I think adds to the variety of sessions a person can attend. This year a new 30-minute session called a "burst" was introduced into the schedule, but I didn't attend one. My colleague +Ryan Grover attended a burst session, but was disappointed that many bursts happened at the same time. That made it difficult to schedule several in a row, and attending a 30-minute burst meant not attending a longer session offered at the same time unless you didn't mind sneaking in halfway through. I don't know what kind of feedback the program committee has gotten, but I hope they find a better approach for the bursts, perhaps something modeled like the paper sessions at the research conference. There, three authors briefly introduce their papers, and then session attendees have the option of sitting at a roundtable for 20 minutes with their choice of two of the authors. Perhaps in the future the bursts could be grouped in a similar way. It's tricky to consistently find good sessions, and session titles like iPad Games for the Flipped Classroom seem far more likely to attract a standing-room only crowd than something based solidly in both research and practice. Then again, I attended some sessions because the presenter was well-established in the field of mathematics education, and frankly, that didn't always translate into a session that was engaging or helpful to me. #NCTMDenver charisma gets ppl into sessions with bad research, but good research sessions with poor presenters have very few ppl. Sad. 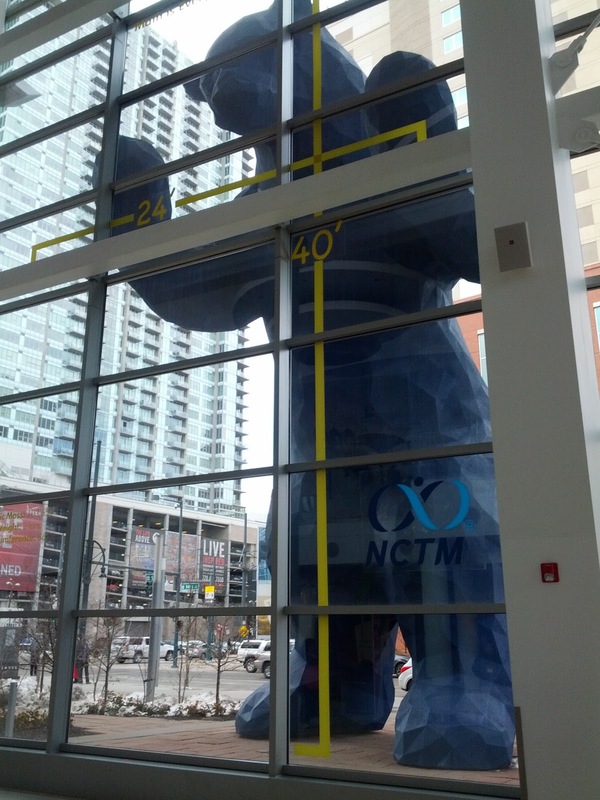 #nctmdenver Exhibition Hall seems strangely irrelevant after two days of processing authentic learning. To me, the above statement doesn't really mean much of anything. By itself, I can't imagine it having an impact on a teacher's practice at all, and even if it did have an impact, there's nothing in the Tweet that describes how this is done. This is a platitude and little else, and I knew it when I tweeted it. I have a theory that these things are retweet bait, and I was testing out the theory. Many of the most retweeted Tweets appear as platitudes to me. That doesn't make them all bad, and it's a phenomena certainly not limited to Twitter, but there's a tempting superficiality there that I'd like to think people are aware of. That's why I'm thankful for efforts like MathRecap that at least offer an opportunity to sink some conceptual roots into solid ground. @MathEdnet Please tweet from it! Want the vicarious experience. @MathEdnet fair enough! Will look forward to it. I certainly could have tweeted Leinwand's talk — he may have been the most tweetable speaker at the conference — but I thought that recording his talk and taking notes would be the better approach in the long run. Conferences reach a limited audience for a limited amount of time. Twitter widens the audience, but is minimally helpful to the person wanting to revisit the event a day, week, or month later. Blogging helps remove limitations of both geographic and temporal limitations, and including audio and video is even better. I've submitted a proposal to present next year, but I'm concerned about conference and travel expenses. As much as I enjoy conferences, it's difficult on a grad student salary to justify spending hundreds of dollars to present to 25 people, when I could reach many more staying home and assembling the presentation for the web for nothing. I'll wait to see if my proposal is accepted first and then decide from there.